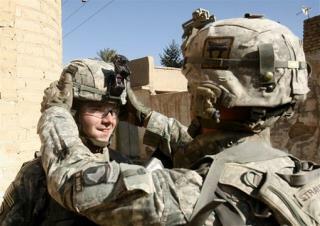 (Newser) – The US Army has dished out $4 million for helmets that can read soldiers' minds, Time reports. The goal is to have commanders in the field think up orders that brainwave sensors pick up and distribute to troops. "It'd be radio without a microphone," says a neuroscientist in charge of the 5-year program. "Because soldiers are already trained to talk in clean, clear and formulaic ways, it would be a very small step to have them think that way." The technology isn't even that radical: Videogamers are expecting a commercial version of it in a $299 headset due out next summer. If brainwave devices work, they could have other non-military uses—like cell phones that allow people to speak silently in their heads. But it may take some training, scientists warn: Users will have to process their unique brain signals in a way that sensors can comprehend. Okay, this is idioitc. If the government is wasting taxpayers money on this, someone should be imprisioned.